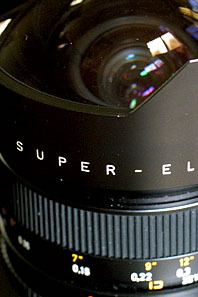 The name of this lense starts from a prefix of 'Super', as we know, there are some lenses within R-Leica Lenses which has this prefix. And other lenses with this prefix were made by Schneider and this lens was made by Carl Zeiss since 1980. The lens has built-in filters of UVa, Or, Y and Bl for black & white picture. Hood is only a rudiment and does not effectively cut the stray light rather it protects the front element from unexpected strike. 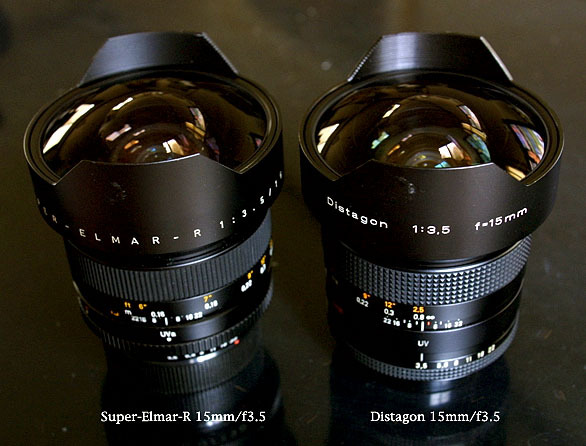 Left is Super-Elmar and the right is Distagon for Contax SLR. In fact, they are the twins which have same construction with a slight difference in coating. Slight fall-off towards the corner is noticed but crisp image continues to the close range. With R8, for the best holding result, the R8 body is a good choice except its overall weight. 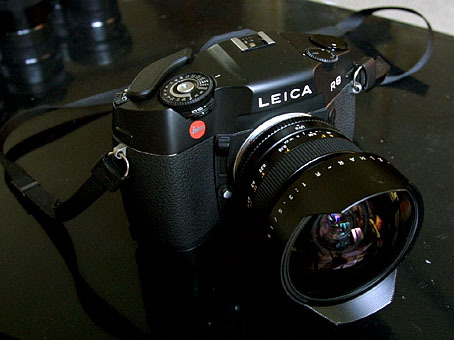 Movement of aperture ring is smooth as well as focus ring.